SlideShare has been called the quiet giant of content marketing because it has so much potential yet not many companies take advantage of its 130 million monthly page views. I wanted to know how to use this quiet giant to move mountains. 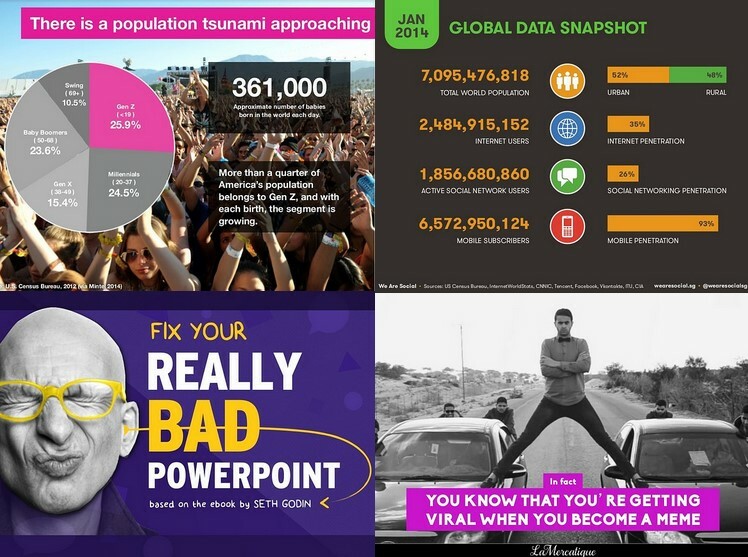 So I analyzed the top 30 most popular SlideShares from this past year. I found 30 popular SlideShares based off a combination of looking for the top shared SlideShares on Buzzsumo along with the most popular tab on SlideShare. Below you’ll find some of the data and what I discovered about how to create an awesome SlideShare. It’s probably the first question that popped into your mind: What’s the perfect word count and amount of slides for a SlideShare? Out of the 30 SlideShares I analyzed, the number of slides ranged from 14 to 183. The median is 50 and the average is 66 slides. I estimated the word count so the numbers might be slightly off but I think it still gives a good idea of what works. The SlideShares had a range of 2 to 70 words per slide. Among the group, the median is 15 words and the average is 18 words per slide. What does this teach us about our giant? We have to be concise about what we say and how we say it. Figure out the one simple idea you want to communicate through the slide and say it in as few words as possible while still making sense. Trim any fat from your SlideShare! Nine of the SlideShares had over 1 million views. These top viewed SlideShares have a common element; all of them had some combination of humor, quotes or statistics. Matter of fact, 87 percent of the 30 SlideShares I analyzed had at least one of these factors in their deck. People go to SlideShare to learn and be inspired. So give them what they want and use quotes, stats and humor where appropriate in your slides. Headlines are a very important part of a SlideShare’s popularity. Besides the starting slide, headlines help readers determine whether they will click to the next slide. Did you notice something? None of these headlines are blatantly self-promotional; however, many were created by companies. If a giant just flexes his muscles but doesn’t do any heavy lifting to help others he won’t get very far on the popularity scale (unless it’s a very spectacular gun show). There’s a surprising design element that’s common among popular SlideShares. Bright colors! Many slides used black and white photos or a darker background with bright boxes or text. Keep this in mind not only when designing SlideShares but also other content that could be recycled into a SlideShare in the future. That’s why for our client CJ Pony Parts we use bright colors/dull background on infographics. It’s important not to stray far from brand colors. You’ll also want to keep consistent with your slide design throughout your deck. Now, go tame your giant!